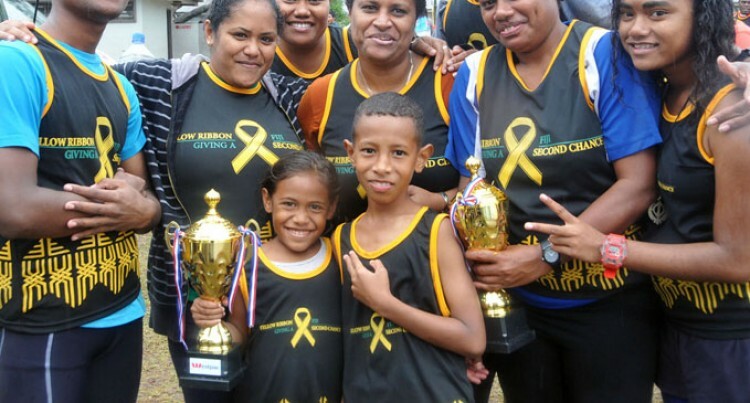 Participants of the Fiji Corrections centre yellow ribbon family walk pose for a group photo in Lautoka yesterday. Young and old braved the cold weather yesterday to support the Yellow Ribbon Family Fun Walk. The event was organised by the Fiji Corrections Service (FCS) to help community members show their love and care towards incarcerated relatives and family members and those who had been jailed. FCS psychologist Leba Kania said the event was jointly sponsored by BLK, Westpac, RB Patel, P. Meghji Trading Limited and South Pacific Distilleries. “The theme of the event is ‘Changing minds, winning hearts’ and the objective is to promote the essence of eliminating stigma and discrimination towards current and former inmates,” Ms Kania said. “Families of convicts, representatives from private and corporate sectors, schools, Corrections officers’ families, and religious groups participated. “We also have family walks in the Central and Northern Division. We at the Fiji Corrections Service may rehabilitate offenders, but once they return to their communities, we need the communities to have an open mind in accepting this minority group. Without your support, they won’t be able to function in a positive manner. “We had 79 people participating and prizes were awarded for the first team to arrive, best dressed team, first female and male youngster to arrive, first female and male to arrive and first woman and first man to arrive.